If you like this stuff sign up as a follower !!! There are bogeymen that we do not speak of, but let us speak of them now. Indeed, Strontium is truly the Bogeyman. The "hit energy" is .546MeV Beta, which if that is not bad enough, the daughter radionuclide of that reaction is Yttrium Y90 with a short half life of 2.5 days....so you get a quick and predictable secondary blast of Beta but this time at a much higher energy at 2.2 MeV. 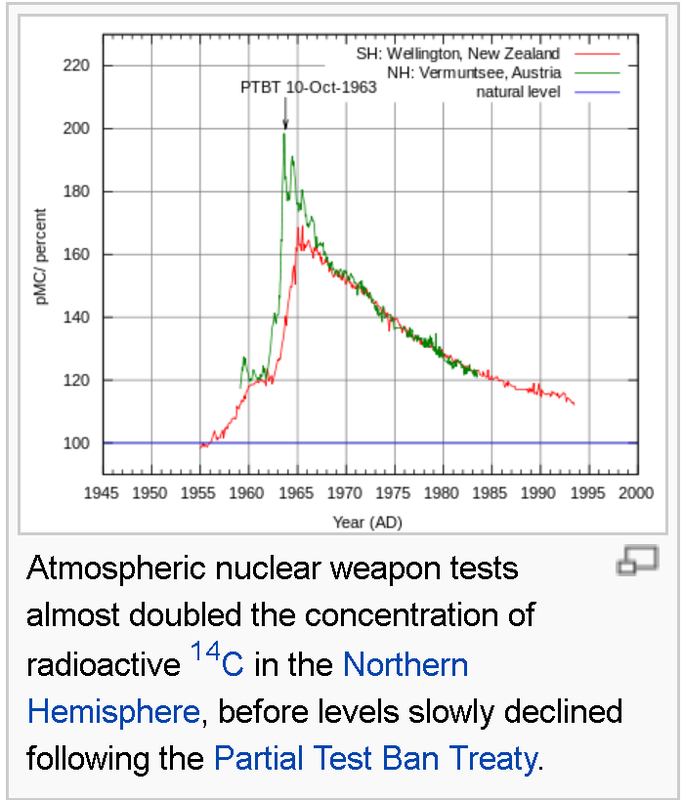 This is THE HIGHEST FORCE punch of any of the common radionuclides. Think Mohammed Ali. Ouch, so first you get sucker punched by the Zombie Bogeyman, then in your weakened state, your get a point blank massive blow from a MMA fighter. 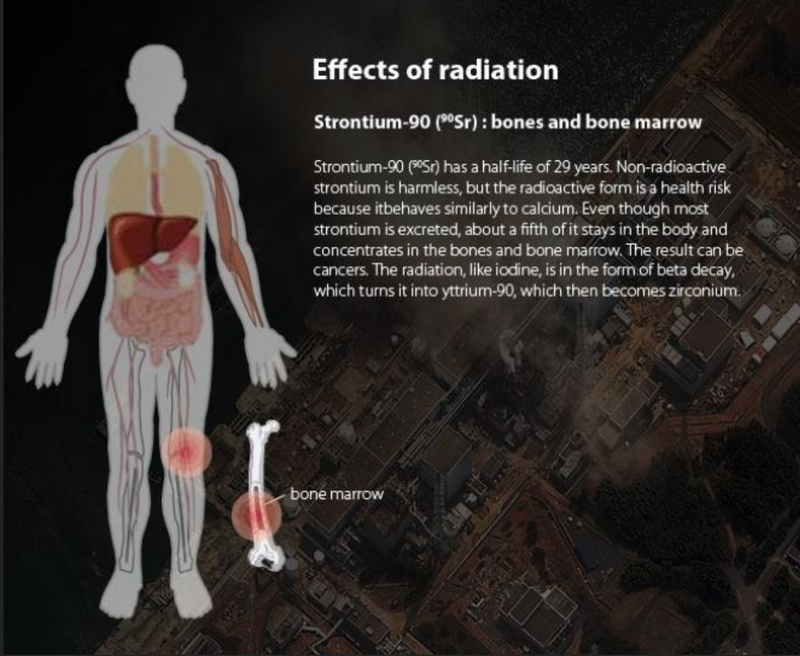 Strontium goes right into the bone and stays there, and of course the blood is produced in the bones, and then you get leukemia, which is terrible and deadly, often very quickly. Bone marrow also produces essential element of the lymph system which is what fights sickness and disease. 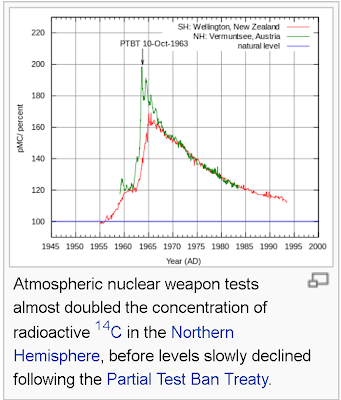 1963 was the peak levels of atmospheric pollution from nuclear testing. Kids tested high in strontium in their teeth (think tooth fairy and that workman's comp nightmare, LOL) in those days. There were also a lot of respiratory realted ailments, and nuclear fallout does cause that. I was born in 1963. I almost died twice from respiratory ailments, in my first 2 years. Nuclear almost got me. Now it's time to Kill Nuke. You can protect against Strontium by loading with calcium (think Tums) but it must be done within 24 hours, and sooner is better. The liars will never fess up within 24 hours. 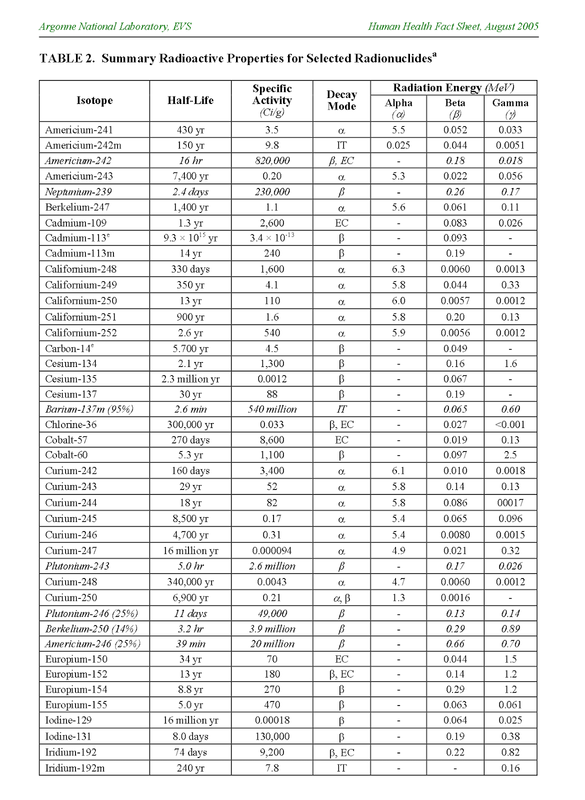 The below link shows how to protect against certain radionuclides. And the Fukushima "water treatment" only takes out the cesium, not the strontium, that is why "they" try very hard to avoid talking about the bogeyman under the bed, Strontium. The Fukushima treated water is thus highly concentrated in strontium. In fact, as of Feb 2013 TEPCO has not done any removal of Strontium, although the infamous ALPS system which can remove some strontium is supposed to be working in March 2013. After that, TEPCO wants to dump the still somewhat radioactive water right into the ocean, because they "don't have room for more tanks". Besides the massive radiation from the initial dispersal exlosions and nuclear fires, and the subsequent continuous groudwater pollution, a further "dump" from nuclear boy, will mean many fish, shells, and coral will have a large concentration of strontium, and the half life is right around 30 years, just like cesium. The gift that keeps on giving. 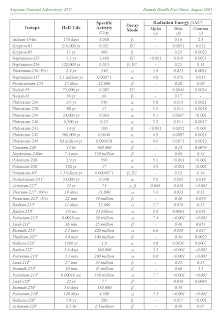 Here is a scientific paper on Strontium specifically related to Fukushima. 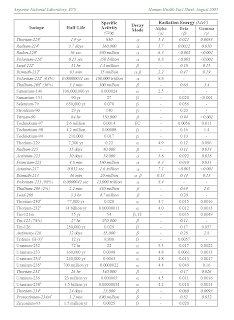 Interesting that the energy levels are different from the ones stated in the biogeosciences scientific document above. To remove radioactive cesium from the water, TEPCO introduced the Simplified Active Water Retrieve and Recovery System (SARRY) in August 2011. Fourteen four-meter-tall cylinders stand inside a SARRY building. Filters inside the cylinders remove radioactive cesium, making the radiation dose 10,000 times lower. On the west side of the plant's grounds, another system dubbed ALPS (Advanced Liquid Processing System) was being constructed. As this can remove 62 of 63 kinds of radioactive materials released from the plant, TEPCO decided to build ALPS to deal with materials that SARRY cannot handle, such as strontium. The one material ALPS cannot remove is tritium. Tritium is basically radioactive water and nothing can filter it out. 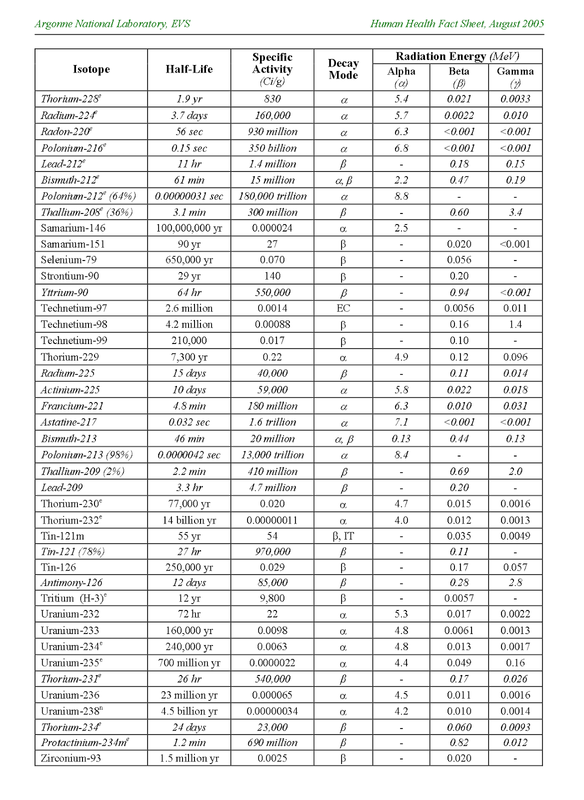 Fortunately Tritium is a weak Beta emitter at 18.6 keV, but the half life is fairly long at around 12 years. All nuclear plants produce and emit tritium. Is the release of Strontium90 the result of a nuclear fission that occurred at Fukushima? 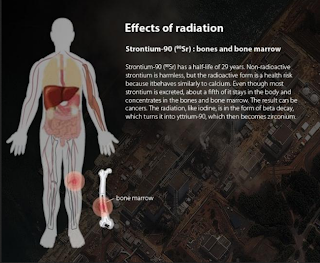 Strontium 90 is the result of fission, whether in normal reactor operation, or in some of the uncontrolled fissions that happened after the initial accidents. It was detected in Milk in Hawaii shortly after the accident. And was quickly hushed up and labelled as "safe" by the Hawaii Dept of Health. They should be prosecuted. Once again you fail to note levels of Sr90 that are hazardous. It seems implausible to me. If the Strontium is bound to the hydroxyapatite matrix then it's extracellular. A second radioactive decay would have a very small chance of hitting the same nucleus. Potassium which is predominantly intracellular would release all its energy in the one cell. 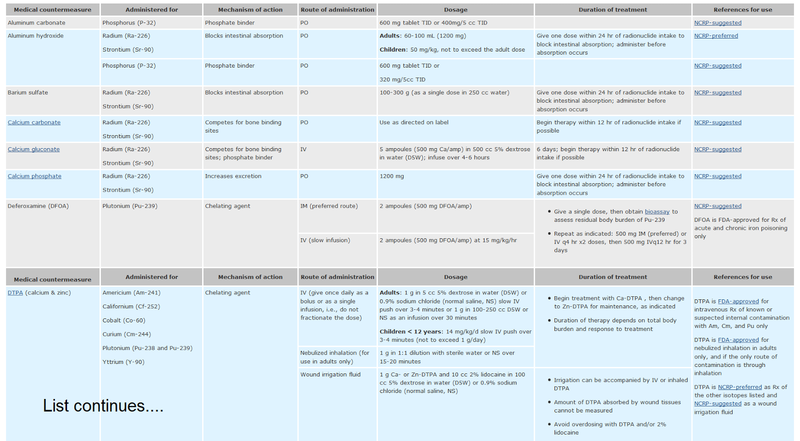 Thus I conclude K40 is much more dangerous than Sr90. Your conclusion would be dead wrong. K40 is Potassium say from a banana, and that is something the human body grew up with. The half life is 1.3 Billion years, NOT a wicked one two punch in the matter of days. K40 gets almost perfectly distributed throughout the cells. Also any additional intake of Potassium causes the body to excrete potassium, therefore adding more potassium does nothing to increase the load on the body. 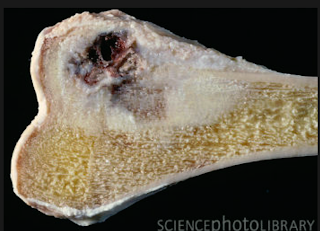 Strontium deposits in bones, and it DOES not deposit uniformly, it forms channels and spherical deposits. These multiple attacks on the adjacent cells. It is universaly known as a strong causitive agent of leukemia and other blood and bone problems. And it builds up. It has a biological half life of 333 years. So no Sir, you would be completely wrong in that conclusion. Can you offer me some evidence please? 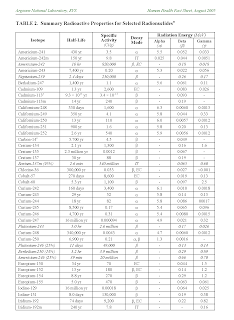 Most of the Calcium/Strontium is not that close to the cells, certainly not as close as the Potassium. That cute picture of a bone cutaway does nothing to reinforce your assertation that "bananas are more dangerous than nuclear power plants blowing up". Seriously, do some research on strontium, it is one of the worst, maybe only plutonium is worse. 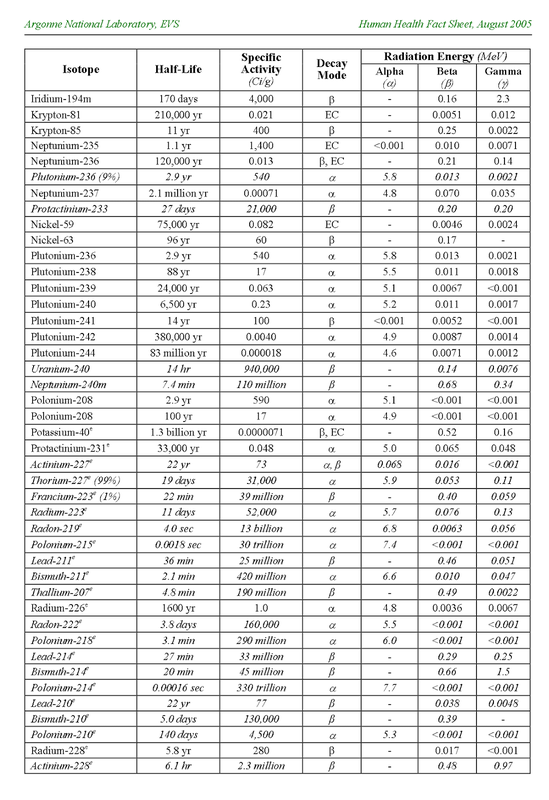 Rad Strontium has a bio-half life of 333 years. Rad Potassium has a bio half life of less than 1 day.